The Indian Head cent coin, also known as an Indian Penny, was produced by the United States Mint from 1859 to 1909 at the Philadelphia Mint and in 1908 and 1909 at the San Francisco Mint.The obverse of the coin shows “UNITED STATES OF AMERICA,” the head of Liberty wearing a feather head dress of a Native American and the year of production. 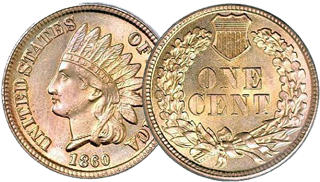 The word “LIBERTY” appears on the band of the head dress.Two reverse designs were used for the Indian Head cent coin series. In 1859 the reverse featured “ONE CENT” within a wreath of laurel. From 1860 until the end of the series the reverse featured “ONE CENT” within a wreath of oak and olive tied at the base with a ribbon with a Federal shield above.The Indian Head cent coins struck between 1859 and 1864 contained 88% copper and 12% nickel. During this time, the cent coin was commonly referred to as a “Nickel” or “Nick,” for short.In 1864, the alloy changed to bronze (95% copper and 5% tin and zinc), and the weight of the coins was reduced from 72 grains to 48 grains. This weight continued for copper-alloy U.S. cents until the 1982 introduction of the current copper-plated zinc cent (about 38.6 grains).The total production of the Indian Head cent coin was 1,849,648,000 pieces. The 1909-S had the lowest mintage, only 309,000. It is not considered as scarce as the 1877 issue (852,500), since fewer of those were kept, particularly in the higher grades.